Upcoming DeAngelis Studio Theatre Events for 2019! DS Dramatics at DeAngelis Studios is very proud to announce three theatre events upcoming for the 2019 year. A terrific stage adaption of the 1994 film, this timeless classic welcomes actors and performers of all ages in an educational theater experience. From costuming to choreography, at DeAngelis Studios, we take a hands-on approach and an all hands on deck methodology of producing our performances. 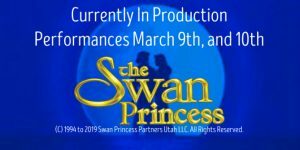 With rehearsals underway, performances are scheduled for March 9th and 10th. More details to follow. There are many scenes and songs from plays and performances that can stir the heart and create action. 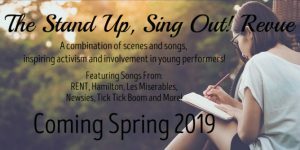 We’ve collected songs from many performances, including RENT, Hamilton, Les Miserables, Newsies, Tick Tick Boom, and more! 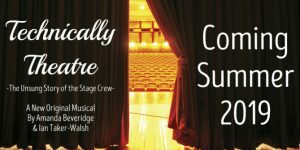 In this original music by Amanda Beveridge and Ian Taker-Walsh, the spotlight finally shines on those behind the scenes: the stage crew! Join us for the unsung story of the stage crew, coming Summer 2019! Make sure to watch our DS Dramatics Facebook page for more information.